The weekly Sunday Walking Street is one of Chiang Mai’s most popular tourist attractions. Make sure that you spend a Sunday in the city when you book a hotel in Chiang Mai. About a dozen city blocks are closed to traffic and hundreds of street stalls spring up selling clothing, trinkets, ethnic art and knick knacks of every kind. But the real treasure here lies in the wats (Buddhist temples) that line the street. 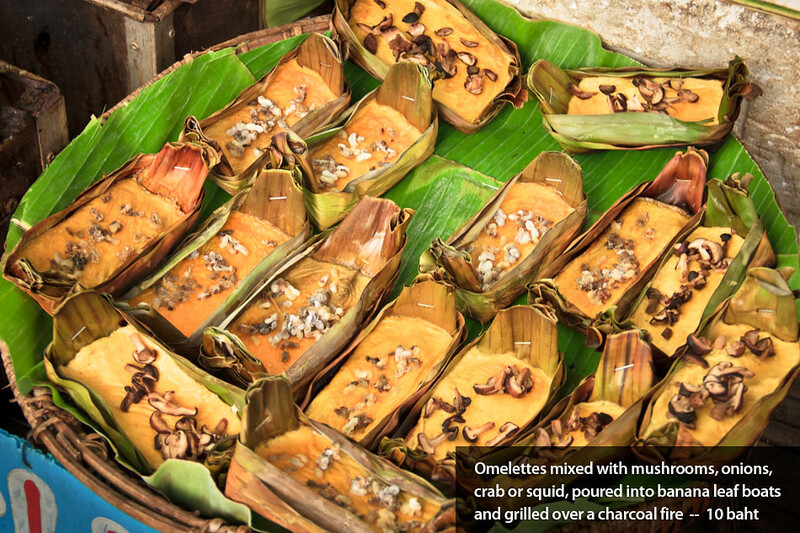 Several are converted into sprawling food markets that offer a dizzying array of amazing food. Portions are small, as are the prices, so it’s easy to sample several different options in a single visit — think of it as Thai tapas. Things get very crowded, so I recommend going early –around 5pm– while many vendors are setting up. By 7pm, things will be so packed you can hardly move. And for reference, 30 baht is the equivalent of $1 US. Hope you enjoy the photos. 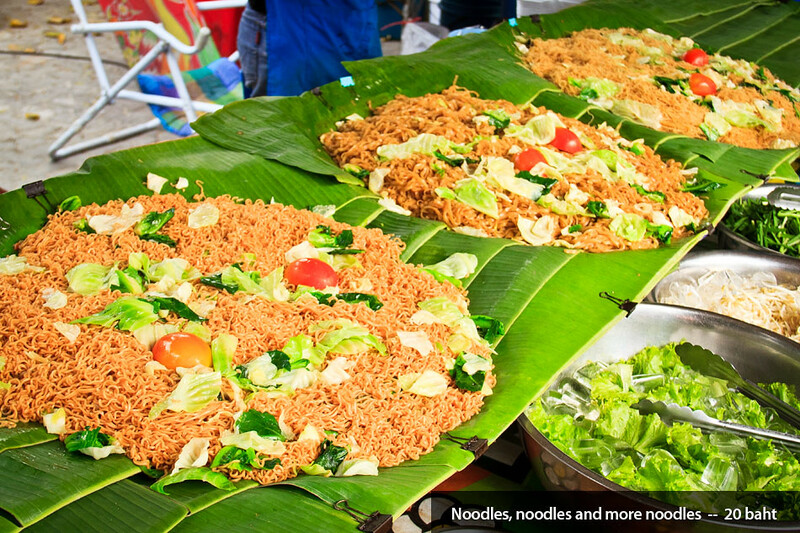 Great shots….and some delicious looking food (love how those noodles in banana leaves look)! Not sure about the crickets, however. Glad to see they’re cooked and spicy. With enough to drink and an offer of some serious cash, maybe I’d try one. Maybe. How are they, by the way? Fabulous scenario right there: going in for a kiss and then you spot a little cricket leg sticking out. Romance killer if I ever saw one, LOL! As usual Wes, your photos are amazing and I’m hungry and I even want to sample a cricket or two. Kisses be damned. mmmm it all looks so good! I love your photos! I was getting nervous there that the best grilled pork in town wasn’t going to be on the list. I see you have saved the best till last. Heh, I couldn’t forget the Pork Lady! Julia recently posted..You Found My Site HOW???? Liar, Thai food is expensive! A mushroom&cheese burger at Mike’s costs 180 baht if you order it with Ice tea instead of with Coke. I’m surprised you didn’t even mention the *cough* P.W. You’re right. A Thai Mexican plate runs 140 baht. Outrageous! Lots of other vending carts and some folks set up a whole mini-kitchen to cook things like stir fried holy basil over rice. The grilled squid is a favorite of mine but beware the green chili sauce, supahot. There is also the nasty deep fried hot dog balls or whatever those things are. 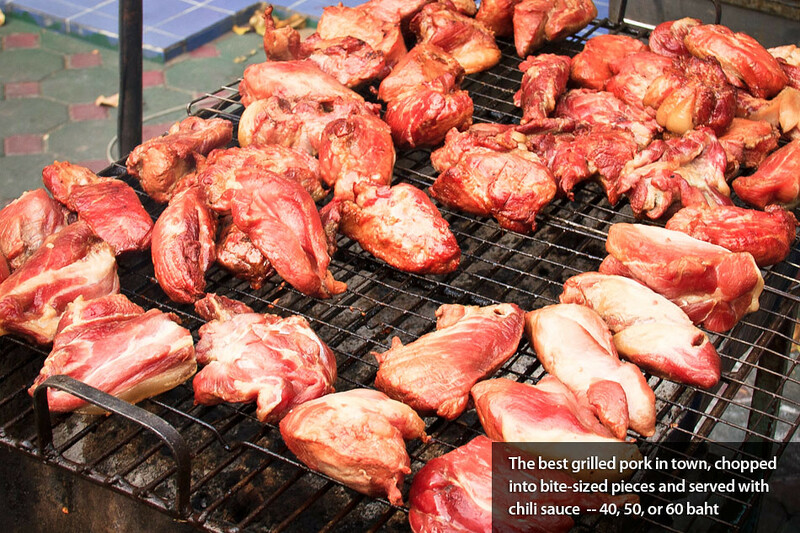 Ah, and lots of syrupy drinks, ice cream, etc., and the ubiquitous grilled pork skewers. 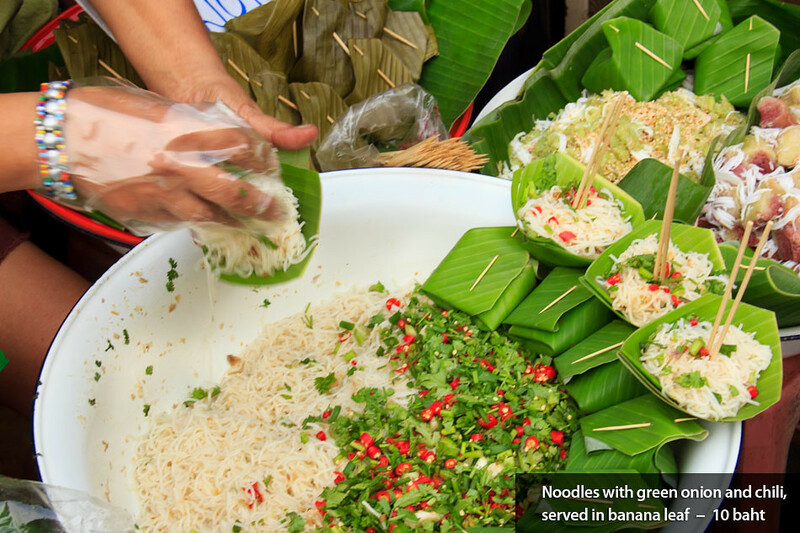 There is so much good street food in Chiang Mai. It’s crazy. Food is part of our everyday and what can really make a location special. I still remember many trips due to meals consumed more than other stereotypical souvenirs. Although, the blue ones are a little odd in color – I’d love to taste them all! I just finished supper and even tho I am quite sated that stuff looks sooooo good it makes my mouth water. I’m hungry all over again. Wow! 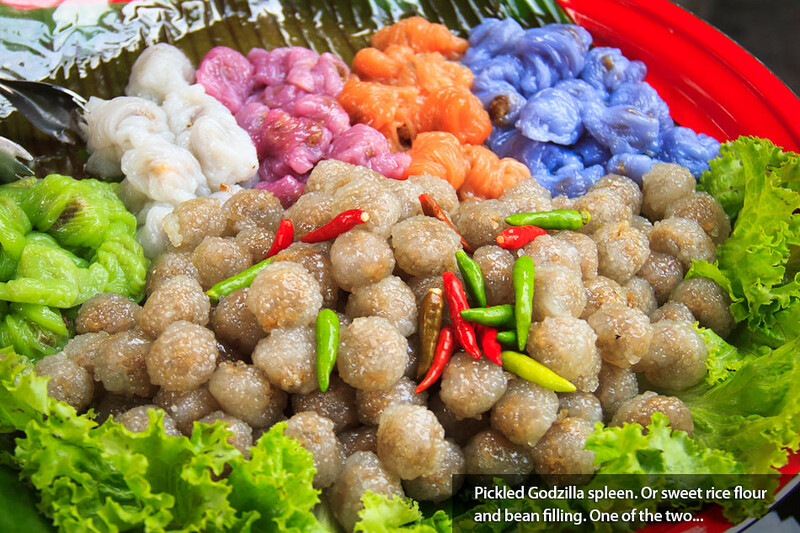 Looks amazing and tempting enough to want to hop on a flight to Thailand right now! 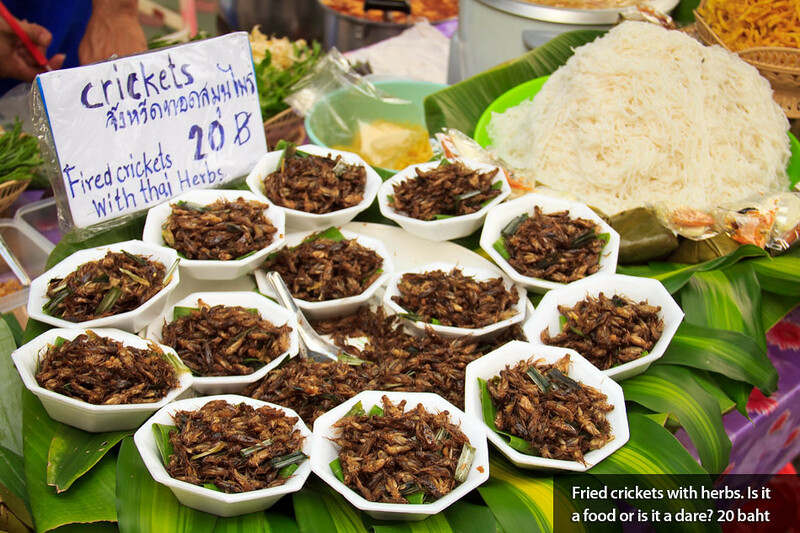 Just curious – did you try the crickets??? Absolutely gorgeous food photography. I can seriously almost smell the dishes. The chicken looks scrumptious. I’m still looking for a quality street food location in Xela… I’m on a mission! Beautifully presented post. 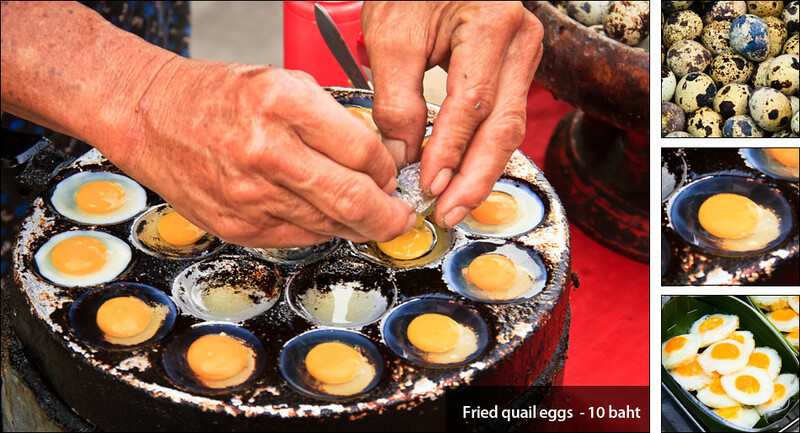 I can’t wait to try the street food when we get to Chiang Mai later in the year. I’m just after lunch and I’m hungry again! Nice shots Wes! That food looks like it’s calling my name! I’m surprised a Buddhist street food area would have meat. But my mouth is watering just looking at everything!! Want to try the first picture and that omelet thing mixed with mushrooms!!! Janet recently posted..My First Client Launch! Heh, we call it the pork what specifically because of this vendor. 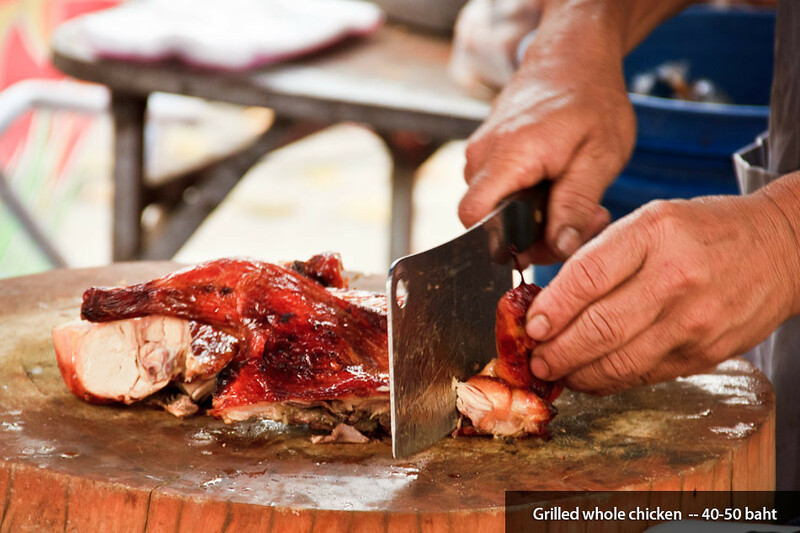 But you’ll find plenty of chicken, pork and fish at all of the wats that participate. I always take pride in the fact that I am willing to try new things… But I might have to draw the line at crickets – Yuck! Although, they are fried and anything fried is usually good! Thanks for sharing these photos! I’m with you on this one. In Cambodia you’ll find grubs and spiders too. Bleh. Seriously. This looks delicious. I cannot wait to try it all for myself. Yum! God, your pictures are gorgeous. Did I just call you God?!! I’d try those crickets in a heartbeat. 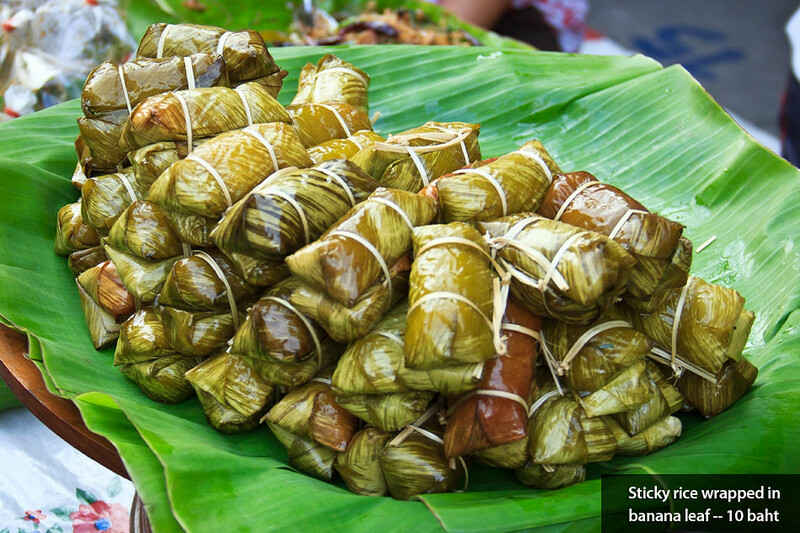 I just wish they were served in banana leave boats too, and not styrofoam bowls – are those styrofoam? And the noodles – oh my, the noodles! Thank you, you just set off some vicious cravings. I’m drooling over so much of this. Makes me want to go back to Chiang Mai.